(CNN) -- The global economic crisis began with the credit collapse in the U.S. and people around the world are holding America accountable. Is its new president part of the problem or the solution? 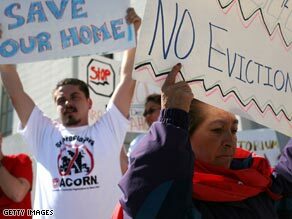 Campaigners in California fight against home foreclosures. In his seven weeks in office, Obama has moved quickly with plans to boost the economy, save banks and protect homeowners. But so far, people in the U.S. are still losing their jobs, homes and savings. Democrats argue that Obama's had less then eight weeks to address a complicated disaster that was eight years in the making under George W. Bush. Treasury Secretary Tim Geithner, the most important man on the Obama economic team, says it inherited "the worst fiscal situation in American history." But many Republicans also blame the first major steps by the new administration: its $787-billion stimulus bill and $3.7-trillion budget. A lot of Republicans seem reluctant to criticize the popular president directly, but they say his approach has been so wasteful and ineffective that Obama is making matters worse. "I thought it was an unfocused exercise. I believe it is going to really hurt our country over time," said Republican Senator Lindsey Graham. On Wall Street, some people believe the damage has already been done. Investment banker Jack Ablin told CNN that "this is their show right now and no longer can they use the 'this is what we inherited' rhetoric." Obama would obviously appreciate more support from Wall Street and his Republican opposition, but for now, he can take comfort in the clear view of the American people. A recent poll by NBC News and the Wall Street Journal found that 84 percent of respondents said Obama inherited the economic mess. And 66 percent said it he would have to be in office for at least a year before he could be blamed too. Obama has time, but even he knows that eventually, the mess really will be his. He won't have anyone to blame if he can't fix it.